The Joolz Hub is the ultimate urban stroller. This compact yet comfortable stroller is fully equipped with amazing premium features. The compact size, fold, transport lock and carry strap are designed to go anywhere you like, by any mode of transportation. Navigate narrow and crowded spaces with just one hand. The large rear wheels guarantee a smooth ride, wherever you go. 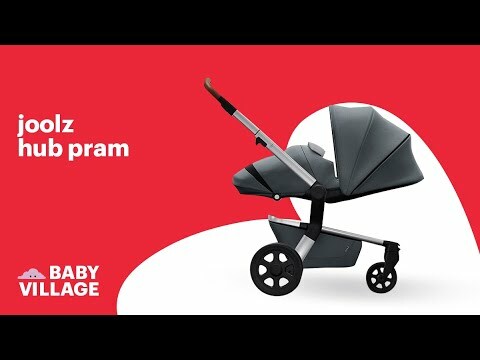 The ergonomic seat has six positions to help your baby sleep, sit and snooze in comfort, while the XL canopy with UPF 50+ protects your little one from the sun. This stroller can easily be stored in even the smallest city apartments. It comes with a seat, and can be paired with a bassinet or the newly developed cocoon for newborns. The name HUB stands for 'Hello Urban Beauty' and is the ideal stroller for real city parents. Zigzag through a crowd, the city streets or tables of a rooftop terrace thanks to its compact 53 cm width. Thanks to the compact size you can navigate the city with just one hand, leaving the other hand free to play peekaboo. The Joolz Hub comes standard with an adjustable seat. The seat is provided with a XL sun canopy with UPF 50+ and see-through ventilation. The comfortable seat can be adjusted in six different positions and is suitable from six months to three years. You can use the Joolz Hub from birth in combination with the separately available Joolz Hub Cocoon or Joolz Hub bassinet. The Joolz Hub features a convenient shopping basket with a volume of 18 litres. Ideal for shopping in the city. After use, you can easily and quickly fold the Joolz Hub into a compact package of 66 x 53 x 34 cm. This makes it easy to store the Hub even in the smallest city apartments. Thanks to the transport lock and the carry strap it's easy to transport the compact package. suitable for children from birth with bassinet (sold seperately) to 20 kg.